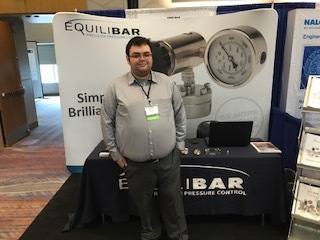 As Applications Engineer for Equilibar, Alan Black is the first person most clients communicate with about their pressure control needs. He is able to assess technical details and make timely and accurate quotations. He works creatively with other engineers and researchers to find the best possible solution for difficult and complex problems. Alan has a B.S. Degree in Physics from North Carolina State University where he did undergraduate research in computational astrophysics. His main focus was hydrodynamic simulations of supernova remnants, a skill he continues to use as he models the performance of valves and regulators. The image at left is a hydrodynamic simulation of a type Ia supernova remnant at an age of 100 seconds, colored by density. Below are an X-ray image of the G19 remnant and a simulation of an idealized remnant with a perfectly spherically symmetric density profile. Before joining Equilibar, Alan spent a year with Virginia Tech’s graduate program and worked as a tutor for physics and math. Alan also develops custom electronic controls and software for integration with Equilibar products. His areas of interest include aerospace applications, supercritical CO2 control, and cryogenic control.